Co-founder of ReadyMade magazine, Grace Hawthorne, is off to the presses in her latest venture. This time around it's not a print magazine, but she's still up to her elbows in paper to make her newest surprise - Paper Punk, recyclable paper building blocks for young and old. The fun and super creative toy is a system of paper blocks that you can use to create a myriad of objects, robots, animals, buildings and more. 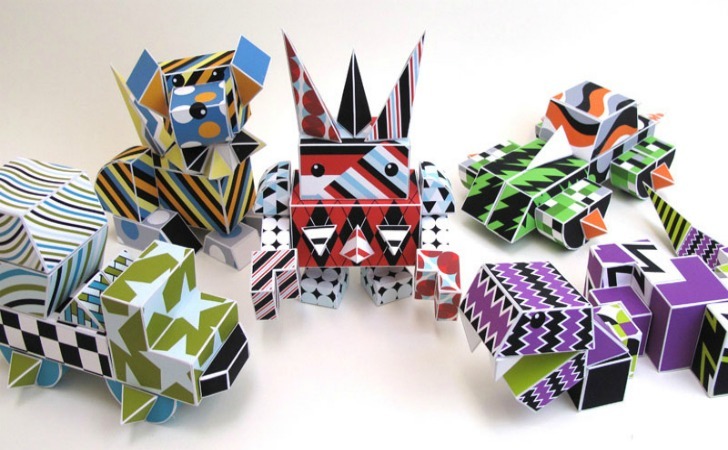 Paper Punk is a triple threat: An eco toy, an art form and a learning tool. After a failed attempt to donate her children’s used Lego toys Hawthorne set out to make something even better, recyclable and totally eco friendly. Hawthorne, who is also a design professor at Stanford University, spent the last couple of years designing the perfect paper building block and has just unveiled the first three kits. Each kit comes in a reusable envelope and contains the flat-packed paper blocks, an instruction poster, decorative stickers and glue tabs. The blocks are die cut into the paper and are easy to remove before folding and bending in the tabs to form a sturdy and colorful building block. All of the blocks are basic geometric shapes, like cubes, rectangles, pyramids and more, each brightly colored with playful pattern. 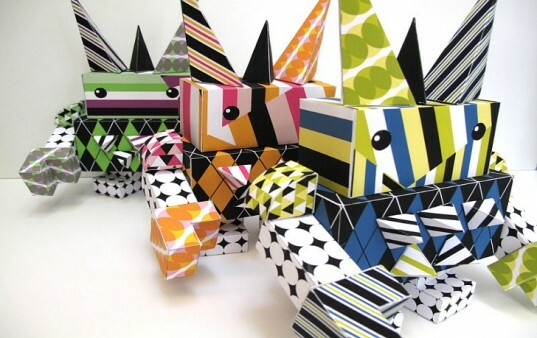 Right now, Paper Punk has three different kits designed with all the parts to make a puppy, a race car and a robot, but because the blocks are totally interchangeable, the limit is your imagination. Another great part is that at the end of the life of the toy, or if a corner happens to rip, it can be recycled along with your junk mail and paper. After a failed attempt to donate her children's used Lego toys Hawthorne set out to make something even better, recyclable and totally eco friendly. Hawthorne, who is also a design professor at Stanford University, spent the last couple of years designing the perfect paper building block and has just unveiled the first three kits. Each kit comes in a reusable envelope and contains the flat-packed paper blocks, an instruction poster, decorative stickers and glue tabs. The blocks are die cut into the paper and are easy to remove before folding and bending in the tabs to form a sturdy and colorful building block. Instructions for the BOT001 kit, which also serves a great graphic poster. REALLY BIG BOT001 TABLE LAMP: A large, delicate, black & white, handmade paper BOT001 table lamp. Never again and only for this campaign. Dimensions approximately: 13 x 9.5 x 13 inches. PUP001 Paper Punk singles kit.